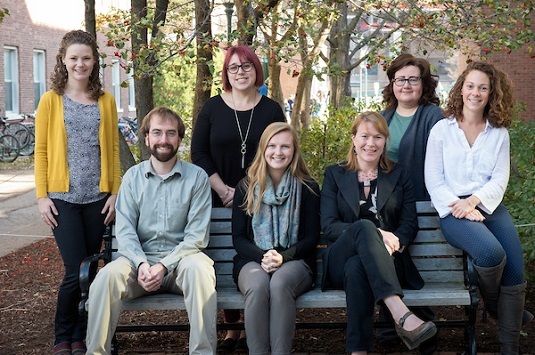 Left to right: Amanda Wells, Matt Manz, Samantha Williams, Lauren Petrie, Marnie Owen, Mary Wozniak, Genevieve Anthony. The Student Services team welcomes you to the College of Engineering & Mathematical Sciences. We look forward to working with you throughout your time as a UVM student. Academic Advisors hold office hours Monday through Thursday, 1:00 PM to 3:30 PM. Career Advising office hours with Lauren Petrie are Tuesdays and Thursdays from 1:00 PM to 3:30 PM. Accelerated Masters Program office hours with Samantha Williams are Mondays from 1:00 PM to 3:30 PM. We encourage you to work with your assigned advisor but all students are welcome to speak with a Student Services advisor during office hours.